Distance: We design the itinerary adapting it to your needs. 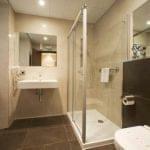 We can prepare an itinerary to meet your needs. Starting your trip from any point along the camino. A popular place to start the French way for example is in Roncesvalles. We will create a personalized itinerary for your Camino de Santiago on bike based on the number of days you have available. We adapt the itinerary to your needs. You can start the Camino de Santiago on bike from any location. For example, a very popular place to start the Camino de Santiago by bicycle is Roncesvalles. We will design the Camino de Santiago itinerary on bike depending on the days you have. Here we offer you a guide to the Camino de Santiago on bike. In it, we will talk about what are the characteristics are involved in this means of transport, as well as its main advantages and, above all, what you will have to take into account when doing it by bike. At the same time, we will talk about what are the main points of interest, which are the best places to eat and where to stay. In these two points, especially, by booking with Santiago Ways you will always stay at the best hotels and cottages to pamper yourself as you deserve. Why choose to do the Camino de Santiago on bike? 1.- You can complete more of the route in less time: Indeed, cycling allows us to choose a longer route. As we travel a greater distance, we will be able to choose between a greater number of routes because most of them can be completed by bicycle at the same time that they are walked. 2.- We have more time: one of the main reasons why we need to do the Camino de Santiago, in general, is the enjoyment. The fact is that the bike allows us to have much more time to do this. We can plan the stages with shorter durations to either go at a smoother pace or have some stops planned at some points of special interest. 3.- It removes the problem of carrying extra weight: one of the most severe problems for pilgrims on foot is the question of weight. When riding a bicycle, we can avoid much of this hassle because our own bike can carry luggage. In addition, Santiago Ways will transfer your baggage between the stages at no extra cost. With it, we can carry more baggage and better equipped and prepared for the route. If you have to take any other transport, as for example, the train, there is no problem because they are all adapted with hooks and spaces indicated for the bikes. 4.- You can also rest whilst on board your bike: When we do the Camino de Santiago walking, we must always make an effort to continue. However, when it comes to riding the Camino de Santiago on bike there is the advantage that, in some sections, inertia and sloping terrain will do that work for us. It will be a good opportunity to rest your legs and enjoy the scenery. This is especially good in the case of mountain pass descents. 5.- It is used to build: with the structure of our bicycle, we can build some small roofing that gives us shade or that, at any stop, shelter from the rain (a very common occurrence on the Camino de Santiago). The bicycle is, therefore, a great ally for all the pilgrims who decide to trust this means of transport to enjoy their experience on the Camino de Santiago. We would like to offer you some general information about the Camino de Santiago and, in particular, about making the Camino de Santiago on bike. 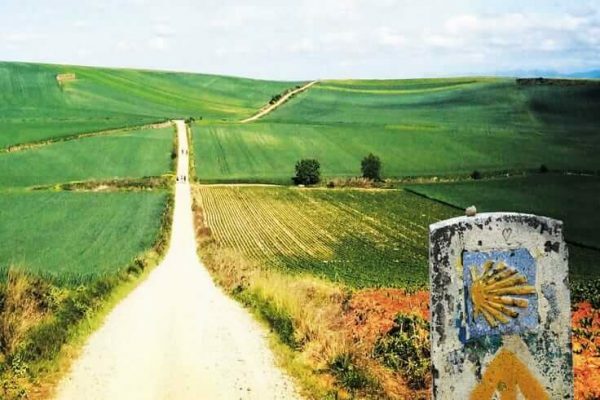 First of all, it must be said that doing it with the help of Santiago Ways is one of the best decisions you can make: there are more than 11 routes available on the Camino de Santiago and, within them, several alternatives. So, if it is the first time you are going to do the Camino de Santiago we recommend that you choose a simple route and one with not much difficulty. In the case that you do it by bicycle, it is highly recommended that you make sure to prepare well. 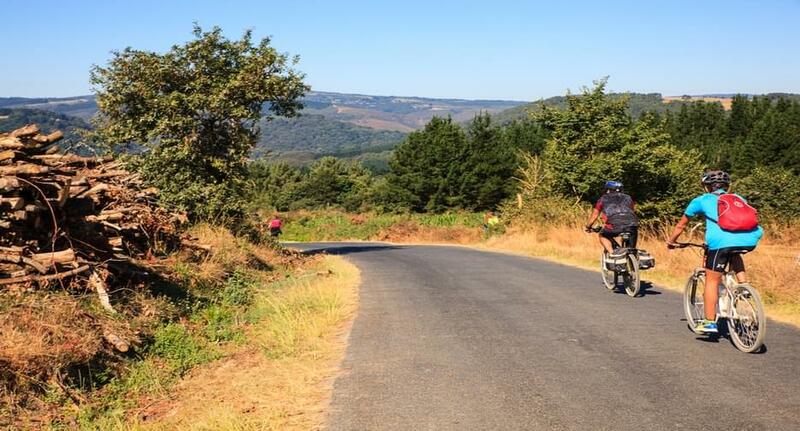 In any case, you should know that the longest route has more than 1400 kilometres (the Via de La Plata by bike) and others are much shorter and can be covered in just 2 days (for example, the Camino de Santiago from Ourense). As we have said, the number of available routes within the Camino de Santiago is huge. Over time, more routes have been appearing: each of which is more interesting than the previous one. What's more, within the same routes, there are also possible alternatives. Within many of them, there are different options in which, for example, change the point of origin and destination. In some, such as the Camino de Finisterre, you can change even the direction. So, there is great freedom both when choosing the itinerary and when choosing how many days you want to take. This is because the bike, as it allows us to have extra time, can make things easier and open up a lot of possibilities. In Santiago Ways, we plan the itinerary according to your own preferences and needs; we give you the possibility to make your reservation throughout the year and also we offer you the possibility to include in your plan breakfast or breakfast and dinner. All this, in the best possible accommodation that include rural houses and hotels. In Santiago Ways, we offer you the map necessary to make the Camino de Santiago on bike. Without a doubt, it will be of great help to you to decide on which route to use as well as to carry out your planning. As we have previously said, the options when it comes to doing the Camino de Santiago on bike are many and varied. That means that different terrain profiles also vary. So there are different possibilities ranging from more complicated profiles to much simpler ones. In fact, they have no relation to the difficulty of the Camino Primitivo (steep and difficult) with the Camino Portugues coastal route (much simpler). How long does it take to do the Camino de Santiago on bike? As the different routes of the Camino de Santiago on bike vary, they also change their profiles and of course their duration. It is not the same to do the Via de la Plata than to do other shorter routes like the one that starts in Finisterre. So then, the duration will depend on the length of the route, the pace you decide to take, the climatic conditions that affect you along the way and the desire you have to stay somewhere in particular to enjoy the landscape or culture of the place. As we have said, one of the advantages that helps us to do the Camino de Santiago on bike is the enormous freedom that it gives us. Therefore, its duration depends very much by taking into account your own preferences. Also, the question of the time of year in which to make the Camino de Santiago on bike depends on the tastes of each person. There are different tastes depending on their character and preferences: some people prefer that there are more people to be able to make new friendships. Other people prefer the tranquillity that the winter gives to complete the route and not find overcrowding in the hostels. In any case, we will talk about each season of the year and we will detail what you should take into account. Spring is a great time to ride the Camino de Santiago on bike. In fact, during this time we can avoid the extreme temperatures of summer and winter and, at the same time, we can enjoy the beautiful places that will have given their generosity. Also, hostel occupation during this time is not excessive so things will be easier. 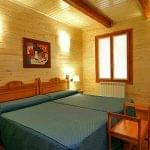 Of course, not as much as if you are pilgrims with Santiago Ways because you will have the best accommodation possible. Summer is the most popular time to complete the Camino de Santiago on bike. In most cases, it is the chosen option because it is when people usually have plenty of time. On the other hand, it is also ideal because there are more daylight hours than during the rest of the year: a very important point for the pilgrims who go on foot. 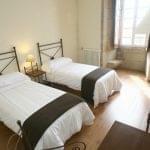 Hostel occupation is higher, although it will depend mainly on the route we choose since not all are equally crowded. Either way, doing it with Santiago Ways is the best way to make sure you enjoy your experience to the limit. 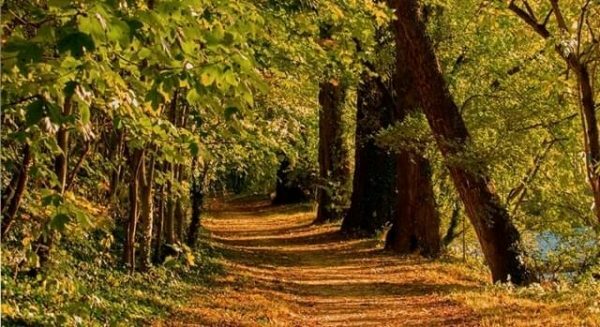 Without a doubt, autumn is another of the ideal times to do the route. The landscapes are dyed in their seasonal colours: brown, green and yellow fill everything and at the same time, the temperature and the climate usually accompany the journey. It is true that, as in springtime, the weather can be more unstable, however the risk can be reduced with more preparation and with the help of Santiago Ways. Winter is a time when there are almost no pilgrims. Cycling the Camino has the advantage that the stages will be shorter and we will be able to enjoy the experience to the fullest. 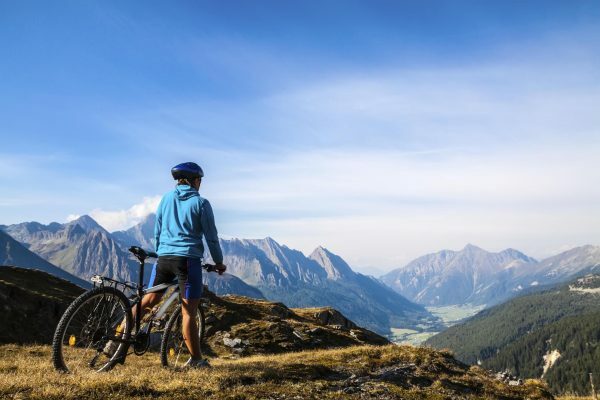 However, in the case of some routes that travel through the middle of mountains, the climate can be an important handicap: such is the case of, for example, the option of riding the Camino Primitivo by bike. 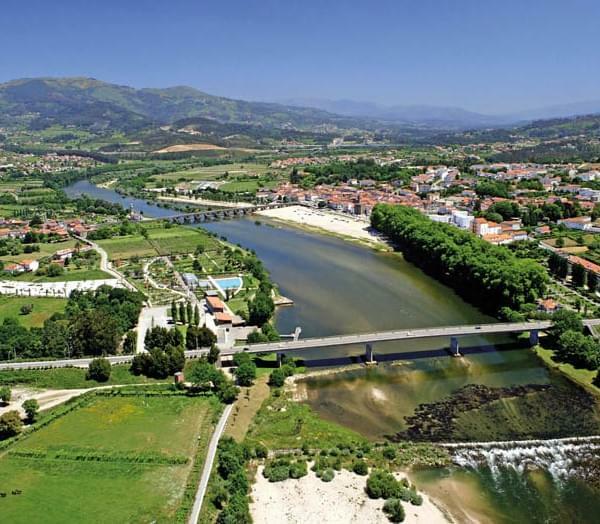 In this guide of the Camino de Santiago on bike we cannot overlook some of the most interesting places of all its routes as well as the best hostels and cottages that we offer. We also want to talk about some of the best restaurants we can find on the way. This is the place where the tomb of James the Apostle was found and where he taught classes and teachings to his disciples. It is also a great point to see all the wonderful surroundings around it. 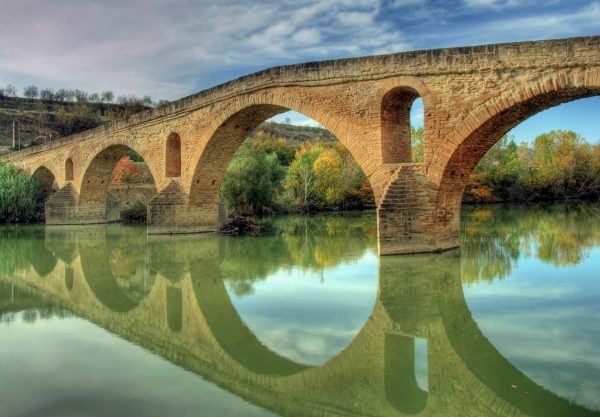 This bridge has survived more than 1000 years to allow pilgrims to go to Santiago. Its name comes from Queen Doña Mayor who ordered to build it on the River Arga. One of the most spectacular monuments of all the routes of the Camino de Santiago is, without doubt, the Episcopal Palace of Astorga. One of the most spectacular cathedrals in all of Europe and, by extension, the world. 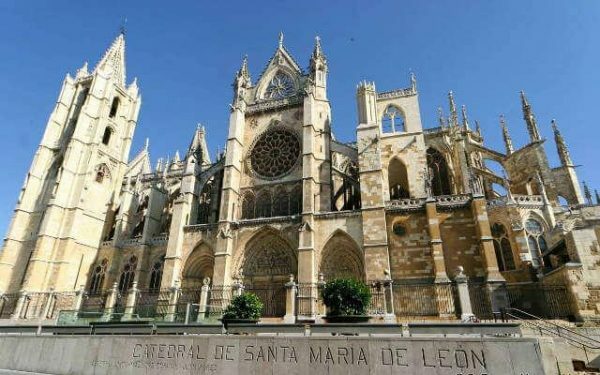 Leon Cathedral has 1800 square metres of stained glass windows with a lot of colour and light. Over 2.2 kilometres, this Roman wall offers us an imposing stamp that was in fact declared a World Heritage site during the year 2000. It is, in fact, the only one in the whole world that remains intact despite having been built between the third and fourth centuries. Also in this city, it is possible to visit its Romanesque Cathedral, a veritable jewel of history and world architecture. 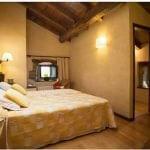 From Santiago Ways, we always make sure to offer you the best possible accommodation. 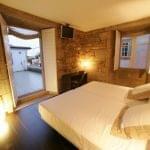 These include hotels and cottages along all the proposed routes of the Camino de Santiago. 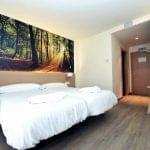 If you are thinking of doing the Camino de Santiago on bike, this option is especially interesting due to the problems of accommodation you can find and to some unwelcome surprises that you may encounter. Pulpería Ezequiel: The greatest speciality of Galician gastronomy, the Octopus, deserves to be tasted in this Octopus restaurant in La Coruña. Totally recommended if you are going to start your route from this locality, for example, on the Way of Lighthouses. 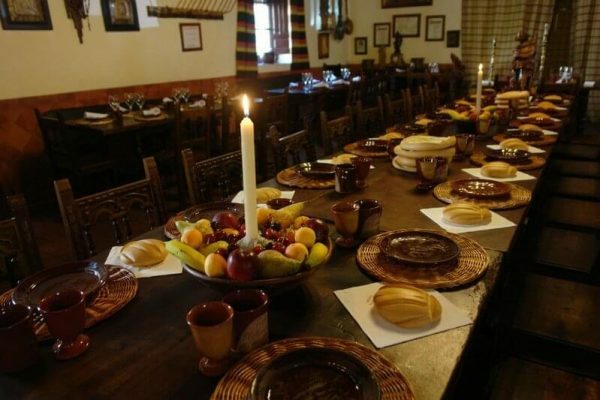 Casa Ojeda: A restaurant in Burgos that offers all the typical preparations of Castilian cuisine. While there are options for all tastes, the ideal meal for pilgrims after a day pedalling hard is to ask for a speciality such as the local stew, for example. Mesón Los Templarios: The biggest speciality of this restaurant in Palencia is the Roast Suckling Pig. You can't go home without trying it. Casa Marcelo: We could not fail to mention a restaurant in Santiago de Compostela among our recommendations. In fact, this restaurant has specialities ranging from the highly elaborated to a more homemade and traditional cuisine. They also have options for vegetarians, by the way. The origin of the Camino de Santiago, in general, has as its starting point the Middle Ages. This principle is good for practically all routes. However, some are more recent than others. For example, the oldest and hardest is the Camino Primitivo. As an alternative to it appeared the Camino Frances and the Camino del Norte which, to a large extent saved the steepest parts of the terrain of the Camino Primitivo. This was only possible as the reconquest extended. For this reason, the Camino de Santiago is also a historical phenomenon closely linked to the history of Spain. Such a process, we could say that was closed with the appearance of the Camino Mozarabe, where the south of Spain joined the pilgrimages from Granada to Santiago once it was reconquered. The Camino de Santiago is one of the greatest experiences that can have in your entire life. Do it and try it for yourself. Here we leave you the opinions of other users who have completed the Camino de Santiago on bike with us and some of their comments about it. I'm sure you'll be encouraged to live the experience with Santiago Ways.